My wounds were a total of: 1. Neck slit one side to the other. We could engage in semantic gymnastics here, but it wouldn’t be productive. Darlie’s neck wound was not ear to ear as she’s implying. It was approximately 3 1/2” in length, angled toward the midline, and was considered superficial by all medical personnel. A possible hesitation cut, frequently found accompanying self-inflicted wounds, was at one end of the longer cut. Dr. Janice Townsend-Parchman: The neck wound was…possibly less than half an inch deep, but it’s hard to say. It is relatively superficial. It didn’t go very deep into her body, and didn’t strike any vital structures. Dr. Santos: This wound cut through the skin and fat, but didn’t penetrate the muscle below. That’s a superficial wound. Dr. Dillawn: I usually don’t measure the depth. We don’t think in those terms. I would call it a superficial wound. Another claim made on a supporter website is that the injury on Darlie’s front left shoulder was 1 1/4” deep. The fact is, there was no testimony from any witness regarding the depth of that wound. Dr. Santos: The shoulder wound went through the skin and into the fat. We just washed it out and closed it. That is a superficial wound as well. It was probably about an inch and a half in length. 2. Two stab wounds on right forearm. Actually, neither were stab wounds. One was a nick, probably a hesitation wound. The other was an incised wound, commonly called a cut. An incised wound is longer on the surface of the skin than it is deep into the body. Darlie’s own attorney, Doug Mulder, said, “I measure the length of the arm wound on the surface at an inch and three quarters.” Supporters and non-supporters have disagreed for years regarding the depth of that arm wound, but the fact remains that it was considerably longer on the surface than it was deep. Why is this distinction important? Because it’s more indicative of a self-inflicted cut rather than a defensive stab wound. Dr. Janice Townsend-Parchman: The larger wound on Ms. Routier’s right forearm went to the bone. If you examine that portion of your right forearm, you’re virtually over bone. You don’t have to go very far in terms of portion of an inch to get to the bone. Dr. Santos: The right arm wound did not injure the bone, it went through the muscle. Another false claim that has hung around for years states, “The larger of the two [arm wounds] caused splintering of the bone in the forearm. According to medical reports, marrow was leaking from the bone.” That is simply not true. No such medical report was admitted into evidence, nor is there any testimony to support such a claim. In fact, just the opposite is true. Dr. Dillawn: The wound on her right arm was to the bone, but the bone at that point is very superficial in the arm. It went through the muscle but there was no fracture. 3. One stab wound on left cheek. There is nothing, including Darlie’s own testimony, to corroborate her claim of a stab wound to the left cheek. Shook: You weren’t stabbed in your face, were you? Darlie: Not stabbed. There were marks on my face. 4. Cut on left cheek. Once again, there is no testimony to support Darlie’s post-conviction claim. 5. Cut across left fingers and thumb. Chris Wielgosz testified that they looked like a very minor paper cut to the hand. Shook: Dr. Santos, is this the type of cut that you’d classify as a defensive wound? Santos: No. Usually they would be larger and deeper. Davis: When you see defensive wounds on the hands, can you describe what they look like? Townsend-Parchman: The most common thing I see in defensive wounds of the hand is deep incised wounds. Now I’m talking about deep incised wounds. Most go all the way through the skin into the subcutaneous tissue on the fingers and palms, sometimes going through tendons or all the way to the bone. The truth is, these tiny marks barely qualify as scratches. They’re certainly not defensive wounds from warding off a butcher knife. It’s possible that Darlie got those scratches as she grabbed the screen with her left hand in order to make the vertical cut of the “T”. Then again, they could be completely unrelated to the crime. There is nothing to support this post-conviction claim. In fact, neither Darlie nor Darin – or anyone else, for that matter – even mentioned cut lips in their trial testimony. Considering that Darlie was the supposed victim of a violent crime, injuries such as this would have been charted and treated in the hospital had they existed. Mulder: While you were in the hospital, did you realize anything unusual about the inside of your mouth? Darlie: Yes, my mouth was very sore. It felt kind of raw inside. Mulder: Did Darlie at any time complain or remark about an injury to her mouth? Darin: Yes, family members were feeding her ice chips because her lips were all swollen, you could see the cuts on the inside of her mouth. Why did this claim of a raw/sore/cut mouth not surface until she testified? The reason is because by then, Darlie knew that her DNA had been found in the toe of the sock. The evidence strongly suggests that she used the sock to cover the knife handle so her fingerprints wouldn’t be on it. Darlie had to come up with another explanation for her DNA in the sock, and also why it took her so long to scream for help: the intruder must have jammed the sock into her mouth. Darin’s testimony also beggars belief. If Darlie had cuts inside her mouth from a sock attack, why wasn’t her blood found on that sock? 7. Red and purple mark on left breast. There is no corroborating evidence or testimony to support her claim. In short, Darlie is clearly exaggerating her injuries. She did have a cut on her neck, but it was not ear to ear. It was relatively shallow, as was her arm wound. There were no cuts or bruises to her lips, mouth, face, or torso. In fact, Charles Linch met with Darlie on June 11th. When he inquired about her injuries, she showed him her neck, front upper chest, and arm. That was her opportunity to show him the cut on her chin or the cuts inside her mouth, but she didn’t. And that is because they didn’t exist. Devon and Damon’s injuries were entirely different from hers. While Darlie’s cuts were incised, the boys had deep, fatal stab wounds to their chest and back that penetrated their ribs, liver, and lungs. One of Devon’s chest wounds was so deep that it went into the posterior portion of his back. 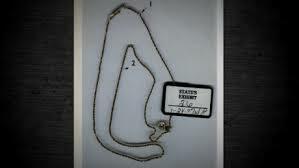 CNN’s 2015 Death Row Stories attempted to account for Darlie’s superficial neck wound by claiming that “the necklace Darlie had been wearing at the time of the attack was so deeply embedded in her throat that it had to be surgically removed. But…it also saved her life, stopping the knife less than 2 mm from her carotid artery.” In other words, Darlie’s delicate necklace somehow prevented the knife from going deeper into her neck. To be blunt, that is a lie. R.N.Jody Fitts tended to Darlie in the emergency room before she was taken for exploratory surgery. Shook: Did you remove a necklace from her neck? Fitts: Right. When the technicians pulled the dressing off the wound on her neck, a chain was freed around her neck. I took that off, set it aside, and later, I believe, one of the other nurses handed that over to the Rowlett Police Department. Shook: Was that under the gauze? Fitts: [The necklace] was underneath the dressing the paramedics had applied. Shook: Let me show you what’s been marked as State’s Exhibit 26. It was unattached? The necklace was not embedded. It was not surgically removed. It was simply stuck to the blood on her neck. In short, something like this might stop a butcher knife.